“Honey, we need a new table, could you please somehow… make one?” We were a young couple, and I was not into DIY project at that time. So I had no idea what to do. I guess we all have been through that moment once, right? Thank god my father is a DIY enthusiast. He told me to use a circular saw and suggested me the best circular saws of all circular saw brands. He even borrowed circular saws from his friends for me, what a great father he is. At first, I was overwhelmed by the amount of information. There are many types such as worm driver, sidewinder, cordless circular saw etc. Even more, there are circular saws for right handed/left handed people. Also, you need to choose the right blades for your work. Last but not least, safety should be your first priority that you should not take it lightly. Now, you might encounter new terms and get confused. Yet, you need not worry since I’ll guide you through everything. Using the information from my father and my own user experience, I was able to make this review. The article is the list of top 5 circular saws. Why are these circular saws included? In this article, I try to include both light-duty and heavy-duty so you can have more choices. I divide the products into two categories including cutting metal and cutting wood. I tend to pick the best out of the class in each category so you can have the optimal choices. DEWALT DWE575SB – Dewalt DWE575SB is a powerful circular saw with 13 amp motor that can cut through any type of wood. The tool has an electric brake for more productivity and less kickback. In addition, the bevel cutting scale is extreme, it is the only circular saw with bevel capacity up to 57 degrees. For added durability, the manufacturer also equips it with cord pullouts resistance to avoid dropping the saw. This is a really good circular saw for cutting wood. 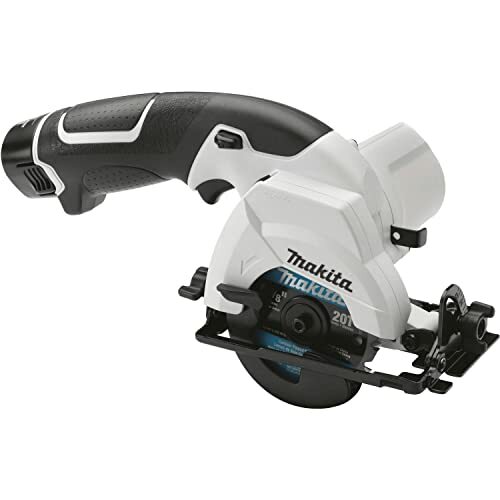 Makita SH01W – This is one is a battery powered circular saw. Since it is cordless, the power and speed might be lower compared to other tools. However, thanks to such low-profile design along with the lightweight make this tool suitable for woodworking in tight spaces like toe-kicks and corners. You can use it in free-hand style. Moreover, you’ll get less kickback since the power and the speed are not enough to create a kickback. On top of that, the lightweight gives you all the control you want to wrestle against the kickback if there is any. Skil 5480-01–This is a similar circular saw to Makita SH01W. However, the main difference is that this tool uses power cord for more strength and productivity. Similarly, this tool is suitable for woodworking. The main selling point of this saw is that it is extremely inexpensive. Nonetheless, it has all the features of a mid-end circular saw like bevel cutting, a laser guide, a rip fence with blade-entry indicators and sight lines. The motor power is as strong as Dewalt DWE575SB. This is a great tool for tight-budget woodworkers. Milwaukee 6370-21 – This circular saw specializes in cutting metal. However, because it is so powerful, you can also use it for woodworking. The highlight feature of this circular saw is the cold-cutting feature. Specifically, the blade generates a minimal amount of heat, thus, the cutting object can be used immediately, increasing your productivity. In addition, it is easy to clean thank to the built-in hot chips and sparks collector. On top of that, the circular saw produces almost no hot sparks at all. It also has onboard sight line for more cutting precision support. Lastly, it has to carry case that makes it easy to store and carry around. 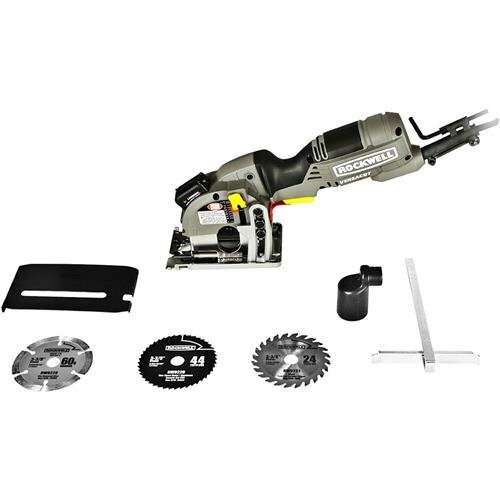 Rockwell RK3440K VersaCut –You can use this circular saw with just one hand. For more precision support, the manufacturer also includes laser guide and rip fence. This tool might look small and weak but it is in fact very powerful. Besides cutting wood, you can use this tool to cut metal plate as well. Additionally, there is a built-in dust blower to blow away the debris from blinding the cutting line, helping you cut more accurately. Lastly, the safety lock prevents children from accidentally starting this tool, this might hurt them severely. This is a sidewinder circular saw using a power cord. Sidewinder uses spur gear, a gear wheel with teeth projecting parallel to the wheel's axis. In other words, the motor and the blade are in a parallel position. With this, the blade spin faster and you can cut straight easily. That’s how this circular saw works in a nutshell. Now let’s see the special features of this tool. Lightweight – Every manufacturer tries to reduce the weight to the minimal. However, being able to force a sidewinder into the weight of 8.8 pounds is pretty impressive. On top of that, the width is just 7 inches. With a little effort, you can operate this circular saw with maximum control. It is by far the lightest circular saw in its class. Powerful – Just because it’s lightweight and small doesn’t mean it’s weak. The motor is cable of generating 5,100 RPM (revolutions per minute) with 1,900 MWO (Max Watts Out). Whatever your tasks are, framing walls, cutting plywood, siding, exterior finishing, and more; the circular saw can handle all these tasks. Cleaning while cutting – Ever blinded by the dust, and it leaves you to wonder where is the line? This issue happens way too often than you might think. That’s the reason why most manufacturers include a dust blower to flee all the dust away from your cutting line. You can cut more precisely with this feature. It also saves your time blowing off the dust yourself. Not to mention that without the dust blower, blowing off the dust while working could be extremely dangerous. Bevel scale in its class – I used to think 45 degree is just enough. However, when I first experienced the 57-degree bevel scale of this circular saw, my first impression was “wow”. There are 3 stops on the bevel adjustment lever, allowing you to use cut in 22.5 degrees, 45 degrees and 57-degree bevel scale. The cut depth is 5.6 inches, suitable for a variety of applications. Cord pullouts resistance – As Tom Silva said: “No matter what you do, you will drop your saw”. You better buy a circular saw with rigid shoes. Or maybe, a circular saw with cord pullouts resistance can be enough. Based the information I gathered from the manufacturer, the ToughCord system provides 12 times better resistance against cord pullouts versus a regular sidewinder. From my own experience, I accidentally dropped several times, and the cord actually does not pull out easily, leaving the circular saw hanging. Less kickback & More productivity – Once you release the trigger, the blade stops spinning immediately. This action provides two benefits. First of all, like a chainsaw, it gives you more safety. Like a chainsaw, a circular saw kickback too. If you lose control due to the dull blade, you might need the brake to stop the movement immediately, before the kickback happen. Second, it creates more productivity. Usually, you need to wait until the blade stop spinning to start a new cut. However, since the circular saw stop immediately with the electric brake, the waiting time is shorter so you can start a new cut faster. Ergonomic & Smooth operation – With the conventional design, you will press your knuckle against the upper blade guard, creating fatigue after long hours of use. Dewalt, on the other hand, has moved the upper guard far away from your knuckle, providing more comfort when operating. Moreover, the lower guard has anti-snag feature, allowing the circular saw to operate smoothly in every angle of the bevel cut. Durable – There are two factors making this circular saw sturdy and durable. The first one is the ball bearing in the lower guard allows the machine to operate smoothly even against dust contamination. Lastly, one of the most important components of a circular saw, the shoes is made of high grade stamped aluminum. Such material gives you a strong and smooth base for cutting precision. Low-quality blade – It’s a Dewalt DW3192 18 tooth carbide tipped blade. Nothing special about this blade yet there is an issue with it. The included blade wobbles too much, preventing you from cutting a straight line. In addition, it can potentially cause kickback. So for your own safety, replace the blade. Unreliable shoes – Even though the shoes made of good material, the manufacturer doesn’t do a good job assembling it together with the saw. It’s not very stable so you need the right technique to cut accurately with this tool. Let me tell you a tip. Get a piece of wood, cut it straight on one side then line it up against the fence to use it as a guide rail. For those who don’t know, a guide rail is a tool to keep to circular saw running straight. Blade not parallel to the base – If you are unlucky enough to get a defective one, you might this problem. The deck shoes (base) are not parallel with the blade. This is a problem because the parallel of those two is the fundamental factor of a sidewinder operation. Therefore, both of them must be parallel for the tool to work properly. For the money, this is a good corded circular saw you would ever want to buy. If you only need woodworking, the tool does the job pretty well. In addition, the electric brake is a rare feature at this price range. It helps you increase both safety and productivity at the same time. Make sure to use better blade other than the included one. Actually, you can cut metal with the wood cutting circular saw. You just need to get the right blade to do the job. However, it won’t give you the result you want. That’s why you need a metal cutting circular saw to do the job. Dual purpose – Like I said, the wood cutting circular saw might not cut metal. On the other hand, a metal cutting circular can do cut both metal and wood together. Powerful – Obviously, a metal cutting circular saw must be extremely powerful. Otherwise, it should be a wood cutting circular saw. The motor is running at 13 amp and generating 3,700 rates per minute. Plus the full grill of razor-sharp, cermet-tip teeth is sharp enough to cut through steel plates from 0.25 inches to 0.75 inches. For thicker plate, you need the right technique to cut smoothly. Cold cutting – Once I was too stupid to realize that while cutting, the blade transfers a lot of heat to the cutting object. I touched the metal plate and it burns my hand. Being paranoid due to the bad experience, I had not dared to touch any object after cutting. As I first heard the cold cutting feature, I was too nervous to try. But I decided to put my trust in the Milwaukee 6370-21 and it didn’t disappoint me. The metal plate was cold. I was surprised. Now I can make use of the object immediately after cutting, instead of nervously waiting for like 15 minutes for it to cool down. This actually boosts my productivity and safety. Easy to clean up - Do you cook? Then you might hate spattering oil when frying meat, fish etc. I guess. Likewise, a spattering oil version of cutting metal is the hot chips and sparks. What’s worse is that you have to collect the chips afterward. Thanks to the cold cutting feature, the circular saw generates only the minimal amount of hot chips and sparks. In addition, it has chip collection feature with a window so you know when you should empty it out. Even more, the shield can deflect hot sparks and chips. Moreover, the empty process is hassle-free. There is a latch speed-release shield latch (a little tap-holding the upper guard and the motor together), you can pull it out and get the shield off. Now you can change the blade or empty the chips at ease. 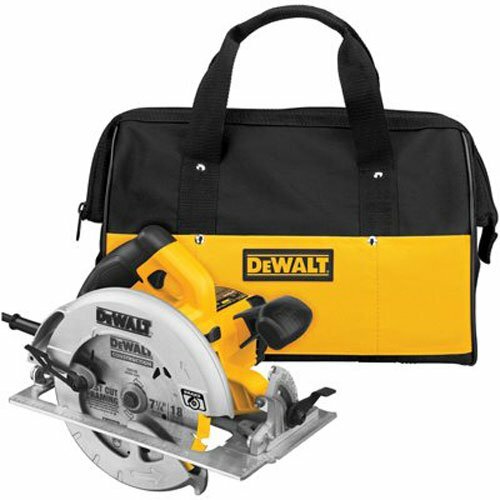 Easy to store – The circular saw comes with the carrying case. A red big case that makes you looks like a pro. Also, there are many spare slots to store more tools on the case. I was really impressed with by the case. More precise cut – The 6370 circular saw will provide you precision support with sight-line a set of onboard sight-line, blade point-of-entry indicators, and a slot in saw’s shoes for a rip fence. For your information, a rip fence is a metal bar parallel to the blade to guide the user to cut more accurately. Based on the width of the cut, the user will adjust the rip fence accordingly. Without a rip fence, the circular saw is useless. Exclusive lower guard retraction lever – A lower guard retraction lever is pretty normal in other types of circular saws. However, in metal cutting section, Milwaukee 6370-21 is the only circular saw that has a lower guard retraction. Particularly, a lower guard retraction lever helps you cut smoothly. High price - Even though the manufacturer applies Dry-cut technology to lower the cost of the metal cutting circular saw, the price is still high comparing to the other types. However, when compared to the peers, the price is still inexpensive for a metal cutting blade. No bevel adjustment – No angle cut, but since steel plate often need only straight cut, the circular saw is still fairly useful right? If you use this for woodworking, it might not be the good choice. Yet my advice is to get a real woodworking circular saw instead of buying a metal cutting one for woodworking. The highlight features of this circular saw are the cold cutting and minimal hot sparks generation. Another feature is the ease of use, as the shield removal process is pretty easy, you can empty the chips out anytime. In addition, you get precision support from the rip fence too. Moreover, the carrying case is really impressive. If you are really getting tired of tripping over the power cord, try a battery circular saw for a better experience. I borrowed one from my father’s friend. It’s the most comfortable and lightweight circular saw I’ve ever used. Even my wife could do a straight clean cut with this circular saw. Appropriate speed for woodworking – With the speed of 1,400 RPM, the circular saw has lower speed than a regular circular saw yet sufficient to cut wood decently. Applications vary from cutting of plywood, MDF, pegboard, particleboard, melamine, drywall and more. Safe and Durable - Less speed is equivalent to less momentum transferred back when kickback happens. In other words, it doesn’t have enough power to cause kickback. In addition, the speed rate generates less heat, preserving a longer life for the blade. Hassle-free bevel cutting & depth adjustment – Like Dewalt DWE575SB, this circular saw has an ease of use bevel and depth adjustment. By simply twisting the lever, you can adjust the bevel scale from 0° - 45° with cutting depth of 1 inch to 0.63 inches. Built-in dust blower – Blowing off all the debris to clear your cutting line for a more accurate cut. Extremely lightweight and compact – Watch out, you’ll get shocked by the weight! It’s only 3.3 pounds, making it suitable for on-the-fly use. Imagine using a circular saw with such weight, I can take control over it without being controlled back because of the weight like other saws. It would also be very convenient if you somehow need to lift it up. The saw is low-profile and thanks to that, you can easily get under toe-kicks or into the corners. In addition, you can use this saw in free-hand style. The weight and the design of this saw are perfect for cabinet work. Since I can lift it up, it’s easy for me to make a scribed line on the top or edge of the cabinet. All I have to do is pick up the saw free-handed, pull the cabinet or cabinet top back a little (about 1 inch or 2 inches), and just scribe the line on it. You can’t get other circular saws to do scribe the line in such tight spaces since their power will definitely cause kickback, which is really unsafe. Secondly, the design of other laws won’t allow them to reach such places. This is the case where larger size and more power do not mean better performance. No more power cord – Like I said, this is a cordless battery powered circular saw. You can bring it to any desired place to work without worrying about getting an extension cord or power outlet. According to the National Fire Protection, Association (www.nfpa.org), power cords or plugs contribute the most to the death rate caused by the electrical accident. Additional battery for more productivity - Knowing that one battery might not be enough, the manufacturer gives you two batteries and a quick charger. So you can use one battery while charging the other. It’s pretty convenient since you don’t have to stop to wait for the battery to charge fully when you only have one battery. 3-year warranty – You not only get a 3-year warranty on the circular saw but also a 1-year warranty on the batteries. Such great quality insurance is the reason why most people didn’t hesitate to purchase this saw. Hassle battery replacement – Might be the manufacturer afraid that the battery would fall out of the saw hence they make the battery clips super tight. I had to use both hands to squeeze the tabs and pull so I could pop the battery out. I even tried to pry the battery pack once. Luckily, over time it has loosened up. Yet if you just purchase a brand new, it might be annoying and irritating. Low battery life – I had to stop in every 20 cuts to replace the battery. Thank God it has two batteries or this tool would be useless. If it wasn’t because of this reason, the tool would be perfect. The tool would actually get more credit if the battery could last a little bit longer. I guess the manufacturer knows it anyway, that’s why they include two batteries instead of just one. Anyway, you can purchase an additional battery, and that would compensate for this downside. This is a mini circular saw. It has a compact and lightweight design like a battery powered circular saw but it needs a power cord to run. It’s a multi-function saw that has the capacity to cut wood, flooring, plastic, ceramic tile, slate, aluminum and even sheet metal. It’s a handy and useful tool with reasonable price. Laser guide – Aside from a rip fence with blade-entry indicator and on board sight line, there is also a laser attached on the front top of the circular saw to show you the straight cutting line. This is an impressive and unique feature of this circular saw. This feature is pretty useful because you can always tell where you will cut next just by looking at where the laser points to. As a result, you can align your cut easily by relying on the laser to lead the way. The laser guide is perfect for plunge cut and rips cut. You don’t have to measure twice with the assistance of the laser guide. This will save your time and money on wasted materials. Compact and lightweight – 3.4 pounds is another impressive weight. In addition, the motor is located at the back of this circular saw, allowing you to hold it with just one hand. I love free-handed operation but this single-handed operation can do an amazing job too. Like a battery powered saw, you can lift it up easily. Moreover, you’ll have maximum control over the circular saw since its weight and power won’t produce enough force or momentum to wrestle with your hand. You’ll have absolute control and safety since your power will be a factor that prevents the kickback in this case. Anyway, the power of this saw won’t be enough to cause kickback so you don’t need to worry anyway. Most convenient depth adjustment – Adjust the depth by simply pulling the depth adjustment lever up and down, then hold the handle and press the circular saw downward, the blade will just sink to the desired depth. The depth adjustment lever places on the very handy position, since you will use this tool single-handedly, you can easily adjust the depth while you are cutting. This will be helpful for the job that requires constant change of the cutting depth. Safety lock – There is a lock that prevents accidental start of this tool. Since the circular saw is compact and lightweight, it’s easy for this tool to reach the children’s hands (I actually think it looks like an attractive toy to children too). It could be dangerous if they use it to play and accidentally start it. Other circular saws are dangerous too, but why they are not as dangerous as this circular saw? Because other tools two hands to operate thus they are always sitting. Meanwhile, with this circular saw, the children can lift it up easily, and they might hurt other people if they start it. Small but powerful – When I first saw this circular saw, I thought that the best it could cut is some thin wood. I read the description that it has only 4.0 amp motor and still gave it a try anyway because of the affordable price. My jaw was dropping when I saw it cutting ceramic tile and metal plate. Built-in dust blower – This is a basic feature that every circular saw should have. This will clear sight for the line to assist your straight cut. Non-marring guard – The worst nightmare to me when cutting fine materials is to leave the scratches on their surfaces. When I unboxed this saw, I was really happy to see a non-marring guard. It prevents the circular saw footplate from marring the surfaces, which is awesome. No bevel cut – This is where Rockwell VersaCut loses points to the Makita SH01W. It limits the circular saw capacity. Maybe the manufacturer wanted to make the footplate mechanism design as neat as possible, thus, sacrificing bevel cutting ability of the saw. It would be a perfect tool if it was not because of this downside. Wobbling blade – The included blades are very thin. When it heats up, it wobbles off the line leaving an ugly cut. I put a straight edge guide in hope of solving this problem but it turned out to be disappointing. At my last resort, I started with a shallower cut then I went deeper and deeper on the next several cuts. Despite how simple it might sound, this method worked out perfectly. Otherwise, you might want to do yourself a favor by changing the included blade another better blade. For example, if you are cutting metal with this tool, make sure to get the metal cutting blade for the circular saw to ensure effective performance. Can’t determine the stop point – When I’m plunge cutting, my satisfaction comes from the fact that I can stop the saw perfectly without leaving any spare cut on the whole plywood. That’s the case when I can see exactly where the blade is. However, the rear-motor construction of Rockwell VersaCut has blocked my sight at the position of the blade. There is the laser guide but it only points to the next location that you will cut, not the exact current location of the blade. This is the product I put as an alternative for Makita SH01W because of the lightweight and compact design as well as the similar price bracket. If you plunge cut and rip cut a lot then this is quite suitable for your job. In addition, since this tool can be used with one hand, it’s suitable for women or housewives who want to share their husbands’ burden. Overall, it’s a good small circular saw for home use. This is an expensive tool that can serve superb quality performance. It comes from one of the most cost-conscience manufacturers. Even though it has lightweight and compact design like a battery powered saw, it gives you enough power as it is a power cord circular saw. Precision support – It has laser guide, like Rockwell VersaCut. In addition to that is a rip fence with blade-entry indicators to guide you to the straight line. With all these features, you only need to rest the shoes right on the object, use the two-point sight lines to measure the line. After that, turn the laser cut line indicator, position the laser right on the cut line then follows the laser and cut it. As long as your measurements are accurate, your cuts will be accurate. Smooth operation – What creates the smooth operation for small cut-off pieces is the anti-snag lower guard. It smoothens up the operation by reducing hung ups caused by narrow cutoffs. Durable – The manufacturer includes durable ball-bearing motor construction to enhance the durability of the circular saw. Stable – The foot size is 20 percent larger than its previous model, allowing more stable operation since the saw can sit tight without wobbling around. It ensures more stability when control and cutting. Inexpensive yet powerful – As I have said, this is a circular saw coming from one of the most cost-conscience manufacturers. Therefore, the price is the most competitive highlight of this circular saw. With only around 50 bucks, you get a circular saw with the power of a 100 bucks model. 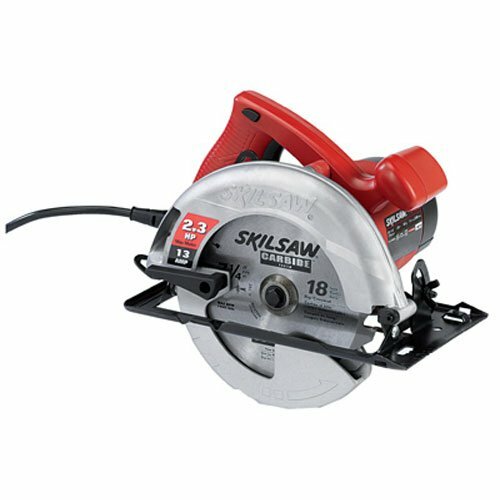 The Skilsaw 5480-01 has a 13 amp motor producing 2.3 horsepower. The power is sufficient to cut through any types of woods. This circular saw is suitable for tight-budget woodworkers. Ease of use – With such inexpensive price, the manufacturer still manages to adapt the simple and convenient mechanism of depth and bevel adjustment from a mid-end saw. There is a rear lever depth-adjustment which is very handy. I lift the lever up to release the shoes, and setting the depth is real simple, the depth gage has marks on it for typical board thicknesses. Then I select the desired a depth and lock the lever back down to tighten it up with the shoes. For bevel cut, release the bevel adjustment and set the desired degree. The bevel scale ranges from 0 to 45 degree like other typical circular saw. Overall, the process of depth and bevel adjustment is just very simple. Safety lock – Like Rockwell VersaCut, this circular saw also has a safety lock to prevent an accidental start. Weak shoes – Even though the manufacturer has increased the foot size, the material is somewhat light-duty that it cannot endure a fall down. The metal of the shoes has no rust-resistance, if exposed to water or harsh environment, it could quickly become rusty. Consequently, the rusty, corroded shoes will affect the performance of the saw. Sometimes, the shoes get out of alignment, you might need to spend some time to repair it. Too much heat – When cutting, the blade produces a lot of heat that if you touch the cutting object immediately, your hands will burn. This is not only dangerous but also reducing my productivity since I can’t make use of the material right away. The price is what makes this circular saw worth purchasing. Like I said, with around 50 bucks, you get all the features from a 100 bucks circular saw. Of course you cannot compare it to the quality of the mid-end saw, however, it does an okay job overall. ​When using this saw, I strongly recommend you being careful. Nonetheless, with the price, it is quite disposable anyway. If you are a woodworker running a tight-budget, this is what you need. After reading all of this, you might acknowledge that choosing a right blade that fits your job is also very important. A circular saw won’t work effectively without a compatible blade. Therefore, here is the list of top blades for different cutting materials. There are many types of circular saws that serve different purposes. Besides getting the right circular saw, you also need to know the right blade to use. As you can see, choosing the right circular saw for your work is not an easy task. By providing the information about circular saws as well as the list of the well-known brands, I hope you can make your own decision based on this information. Anyway, I rate [insert name here] as the best circular saw on our list.